Back in January I started writing what I call BAFacts; daily snippets of astronomy factoids. I post them on Twitter and Google+, and I keep an archive of them on the blog, too. On May 13 I tweeted this one: BAFact: A supernova has to be less than about 75 light years away to hurt us. No star that close can explode, so we’re OK. The distance may actually be somewhere between 50 – 100 light years, and it depends on the kind of exploding star, but I have to keep these factoids to about 110 characters to tweet them. Nuance is at a premium. I got so many replies about that one that I decided to do a theme week, and stick with supernovae. The next day I tweeted this: BAFact: The nearest star that can go supernova is Spica – it’s 260 light years away, so we’re safe, and I linked to a video I did a few years back this. A few minutes later I got a tweet from Nyrath, saying that he thought the nearest star that could explode was IK Pegasi, 150 light years away. I looked this up, and here’s the thing: he’s right! I had never heard of IK Peg, so I didn’t even know it existed. And it turns out it is the nearest star that can explode, though technically it probably isn’t. And you know when I say something weirdly oxymoronic like that there must be a good story here, right? Mwuhahahaha. Yes. yes, there is. Stick with me; this is long, but also awesome. It’s been known for a while that IK Peg is a weird star (you can read quite a bit about it on the ESO website, though the formatting is a bit messed up). It looks like an A-type star — that is, more massive, hotter, and bigger than the Sun. It’s not nearly enough to explode — stars need to be at least 8 times the Sun’s mass to do that, and this star is only about 1.7 times heftier than the Sun. It pulsates, getting brighter and dimmer on a pretty rapid timescale: each cycle only takes about an hour. A lot of stars do this, but typically when one does it means it’s nearing the end of its life. In a few dozen million years it’ll swell up into a red giant, blow out a strong wind that’ll strip its outer layers away (creating a gorgeous planetary nebula), and eventually retire as a white dwarf; small, dense, and hot, cooling slowly over billions of years. Except… there’s a monkey in the wrench. The star isn’t alone. It has a companion. And this is where things get interesting. Years ago, the Germans launched the ROSAT satellite designed to survey the entire sky looking at objects that emit extreme ultraviolet light (this is the one that burned up in late 2011 over the ocean). UV emitters tend to be hotter objects, like massive stars and gas. At the position of IK Peg they detected a strong UV source. A-type stars aren’t nearly this bright in the UV, so it was clear something was up. In fact, it had been known for a long time that IK Peg had an invisible companion — there was a periodic Doppler shift in the spectrum, which means it was sometimes approaching us and sometimes receding, as you’d expect for something in orbit around something else. So this companion is bright in UV, faint in visible, and massive enough to cause that Doppler shift in the A star. Its mass is too low to be a black hole or a dense neutron star, so it must be a white dwarf. These are very hot, so they blast out ultraviolet, but so small that they’re faint in visible light. Interestingly — very interestingly, as we’ll see in a moment — this companion star is pretty high-mass for a white dwarf, about 1.1 to 1.2 times the mass of the Sun. Usually, white dwarfs are around 0.6 times the Sun’s mass, and it’s rare to find one that heavy. For future reference, in binary systems, the brighter of the two stars is given the designation A, and the dimmer B. So the A-type star is IK Peg A, and the white dwarf is IK Peg B. White dwarfs, as I mentioned above, are the leftover cores of stars like the Sun that lose their outer layers. The Sun will become one in about 6 -7 billion years, when it uses up its supply of hydrogen fuel in its core. This means the IK Peg system is old. And just knowing what these two stars are now, we can unravel what they were like long ago. A long time ago, billion of years ago, there were two stars orbiting each other. One was much like the Sun, but the other more massive, probably 3 – 4 times the Sun’s mass. More massive stars live shorter lives, so this star blew through its fuel, and expanded into a red giant (the details of this are complex, but you can get a synopsis here). When I say expanded, I mean it: it got huge, so big it enveloped the other star. This is called a common envelope system — and think about that: we had a whole star physically inside another star! 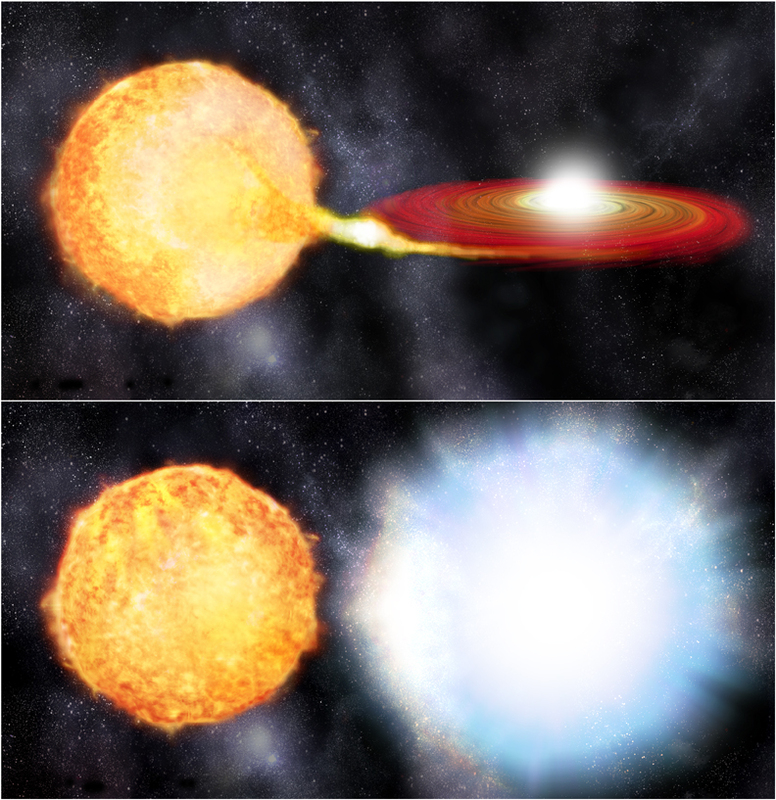 During this period the lower-mass star actually gained mass, drawing material from its bigger companion. As this was happening the red giant was blowing out a strong wind of matter, which, over time, leeched away the outer part of the star. What was left was a hot white dwarf — IK Peg B — and a normal companion star — IK Peg A — that was now somewhat more massive than it was before. Impressively, we can detect all kinds of elements in the atmosphere of IK Peg A that shouldn’t be there; these are what it sucked away from IK Peg B while it was still a red giant. And there you have it. That’s the system we see today. OK, cool. But of course, not even the most stable relationship lasts forever. IK Peg A is aging. It’s still fusing hydrogen into helium in its core like the Sun does. But remember, those pulsations are telling us it’s nearing the end of its life too. At some point in the future, probably in a few dozen or hundred million years, it too will swell into a red giant. When it does, the reverse of what happened before will occur. Material from IK Peg A will flow onto the white dwarf. Separated by a mere 30 million kilometers or so (closer than Mercury is to the Sun), this transfer of mass will flow steadily. As the matter piles up on the surface of the white dwarf it gets fiercely compressed and hot. At some point the temperature gets high enough to flash fuse it into helium. There will be an explosion — big, but not big enough to destroy the star — called a nova. Some of the hydrogen will remain, as will the helium. When things calm down, the material from the red giant will start to pile up again. One day, something very bad happens. When the dwarf reaches a mass of about 1.4 times the Sun, the physical forces inside the star can no longer support its own mass. 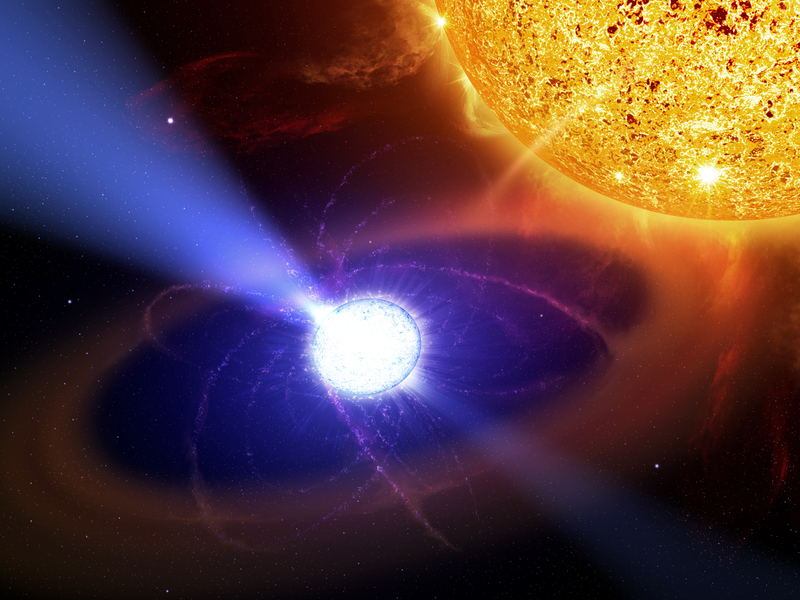 The white dwarf starts to collapse, and the core temperature rockets skyward. A fusion chain reaction is ignited in the dwarf, and the conditions inside it cannot stop it. Within seconds, the chain reaction runs out of control, consuming the bulk of the star, and it explodes. And oh, that explosion. Blasting out of the living hell that was once a normal star is so much energy it can outshine an entire galaxy. In seconds the newly-born supernova releases as much energy as our Sun will over its entire lifetime. And when it finally fades, weeks later, there may be a dense neutron star left over, or it’s possible the star will have blown itself to bits. But either way, the mind-numbing energy is on its way, spreading out into the galaxy. Supernovae are among the most violent events in the modern Universe. You don’t want to be near one! Which is something of an issue. IK Peg is only 150 light years away. Now, don’t panic! That’s probably far enough away that the damage to Earth would be minimal. The flood of ultraviolet and higher-energy light might affect our ozone layer, but from my reading on this — which is extensive, since I wrote a chapter in my book Death from the Skies! about this and went through dozens of journal articles — 150 light years is far enough to dim the effects substantially. And we’re safer than that. Measurements of the system’s velocity shows it to be moving away from the Sun at about 20 km/sec. That’s about a light year per 16,000 years… and remember, IK Peg A won’t go red giant for probably millions of years! They’ll be 60 light years farther away for every million years in the future the system sticks around, and if IK Peg A can hold its breath a little longer, it could easily be a thousand light years away before it goes. At that distance a supernova is no danger for sure. Which leaves me in a funny spot. Right now, IK Peg is the closest potential supernova. But by the time it goes off, it won’t be! Spica is close right now, as I pointed out before, but in a few million years all these stars will move. What’s close now may not be by the time one of them goes supernova, so the idea of which potential supernova is closest doesn’t have a lot of meaning. The better question is "which one that goes off next is the closest?" and there’s no real way to answer that. Predicting just when a supernova will explode isn’t possible. But I think that’s OK. What we’re really asking is, what stars near us can explode? And it turns out the answer is that there are a lot within a thousand light years, a handful within 500, and none within the hard 50 – 100 light year limit. In other words: you can take supernovae off your things-to-be-scared-of list. They’re all too far away, at least for the next few million years.You can breathe easy. My very sincere thanks to Nyrath for pointing this whole thing out to me! – AstroAlert: Type Ia supernova in M101! – WR104: A nearby gamma-ray burst?